Photography is not my usual medium, but I like to participate in as many EBSQ exhibits as possible. So after a previous night's rain, I went wandering about the yard next morning with camera in hand. This was my best effort, in my opinion... 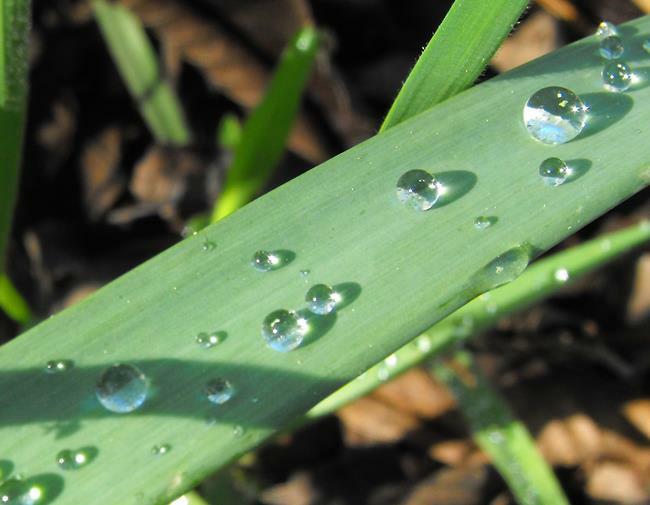 Fat, round, crystalline raindrops resting upon a daffodil "leaf". Perfect for the April 2015 exhibit, "Raindrops on Roses and Other Things". I particularly admire the largest "sphere" in the upper right -- it is such a small thing, relatively, but it looks so... planetary. Other-worldly, in and of itself, like a heavenly body.